4-Word Review: Dead wife haunts husband. Dominque (Jean Simmons) is a woman suffering from a fragile mental state who is convinced that her husband David (Cliff Robertson) is trying to drive her insane. She eventually hangs herself and then her ghostly presence comes back to haunt him, which ends up driving him over the edge Dominique (Jean Simmons) is a woman with a fragile mental state who is convinced that her husband as well. The film was directed by the talented Michael Anderson, but you’d hardly know it as the DVD transfer by Synergy, which is already known to produce some very low grade quality stuff and looks like somebody’s badly lighted, grainy home movie. Unfortunately this is the same transfer that gets streamed onto Amazon, so if you want to see this otherwise rare movie you’ll have to buckle-up and accept the substandard look. As for the story, which is based on the novel ‘What Beckoning Ghost’ by Harold Lawlor, it’s not all that much better as the plot and characters come off as stiff and one-dimensional. There’s no backstory either, which I felt was needed to help explain why Robertson is an American living in England and what specific job does he do that allows him to be able to afford such a big mansion? There’s also passing mention of Dominique being in an earlier accident that might’ve helped explain her mental state, but it’s never talked about in detail, or better yet shown in flashback. Initially it’s a mystery as to whether Robertson is trying to drive Simmons mad or if it is all just in her head. Finally towards the end he admits to it and supposedly it’s all just so he can get his hands onto her money, but wouldn’t it have been much easier to hire someone to kill her and make it look like an accident then trying to drive someone insane, which has no guarantee of working and could take years and years to accomplish? Also, if Dominique is already aware of what he is trying to do then why doesn’t she just leave him instead of turning to suicide? The ghostly special effects consist of shots showing a piano playing by itself as well as a shadowy figure walking from a distance, which isn’t much and gets repeated at several different points, which becomes quite redundant. Both stars are wasted as well. Simmons is good, but she’s only in it at the start while Robertson much spends the entire second-half saying very little and instead relying on his almost constant shocked/scared expressions to help propel the plot along. Despite all this it still manages to be moderately compelling and may appease those who are in to ghostly tales. The twist at the end is a definite surprise, but it also leaves open a lot of logic loopholes that makes the entire thing seem quite implausible. 4-Word Review: Don’t answer the phone. People are being killed throughout the city of Toronto by simply answering the phone. Apparently someone has come up with a device that can create a massive electronic blast that can go through the phone lines and kill anyone listening on the other end. The blast is so strong that it can even melt the receiver. Nat Bridger (Richard Chamberlain) who is a professor at a local college decides to take matters into his own hands and investigate on his own after one of his students is killed and the police seem to do nothing about it. Initially I found this idea to be intriguing and original, but unfortunately it throws credibility completely out the window. Had it worked more with the idea of sending some loud noise at an extremely high decibel over the phone, which would then blow out the person’s ear drum, or something of that nature then I might have bought into it. Instead it has some sort of unexplained blast that literally makes the person at the other end blow off of their seat and fly backwards crashing into walls and windows, which seems utterly ridiculous and cartoonish. The film also offers no scientific explanation to how this device was created or done, which makes it farfetched and pointless. Chamberlain’s one-dimensional acting doesn’t help and his presence in the lead role is quite generic as he plays a character that shows the street smarts and fighting ability of a seasoned cop instead of that of a college professor making things even more unrealistic. John Houseman gets a rather thankless supporting role as Chamberlain’s mentor and is pretty much wasted except for a bit where he disrupts a guided tour through a phone company which proves mildly amusing. The technology is horribly dated making the entire thing a relic of a bygone era and irrelevant to today’s audiences. The climatic sequence dealing with Chamberlain’s attempts to keep the bad guy on the phone while the police try to trace the number is highly clichéd and more boring than intense. Director Michael Anderson’s attempts to jazz things up a bit by photographing phones in intimidating ways with ominous music playing in the background comes off as unintentionally funny instead of scary. 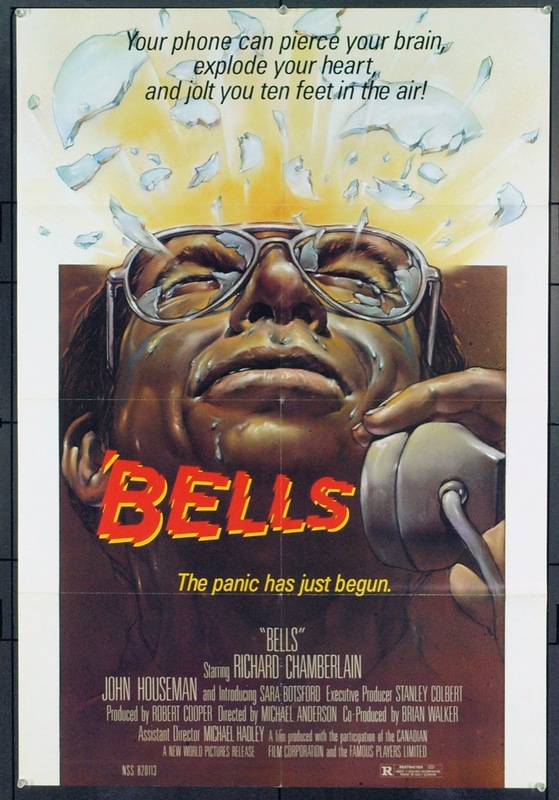 This Canadian made thriller was originally released under the title above and ran for 95 minutes, but the Warner Home Video version, which was released in 1998 and goes under the title of Murder by Phone was trimmed by 15 minutes. The version reviewed here is from the original release although the film is so silly that watching the shorter cut might be preferred simply because it would mean less time wasted.